Hey kids, what time is it? There is something about this clown that just doesn't seem so right. Is it the eyes? We don’t know, but we wouldn’t recommend hanging this in your child’s bedroom. 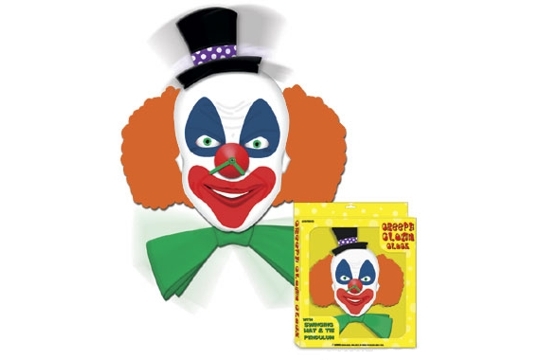 The soft foam Creepy Clown Clock is 13 by 10 inches and will delight anyone (except your coulorophobic friends) with its swinging hat and it's tie pendulum. The clock is in the original packaging, never having been removed. We've seen these priced as high as $46.00 on eBay and elsewhere!